It’s good to know Rep. John Lewis can look back on all the awfulness he experienced as a youth and laugh about it now. According to Nate Powell, the artist who has teamed up with the Georgia Democrat to help keep alive the revolutionary spirit that changed the state of race relations during the turbulent 1960s via a series of graphic novels, humor remains one of the greatest tools in the non-violent activist’s toolbox. 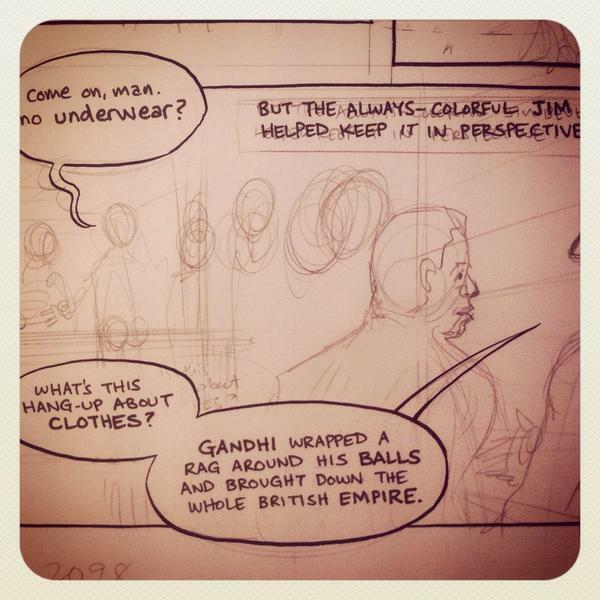 “Another day, another joke about nutsacks and revolution at Parchman Farm prison, 1961,” Powell shared with the Twitterverse while revealing a rough sketch of a panel from the second installment of Lewis’ incredible life story. The septuagenarian lawmaker skipped Comic-Con this time around (Powell and co-author/congressional aide Andrew Aydin, made the trip ), but is expected to return next summer with continuing saga in hand.